Boxing trainer Floyd Mayweather Sr. confronted former world champion Erik Morales for saying that Manny Pacquiao can beat his son, Floyd Jr. In a video from FightHype.com, the older Mayweather suddenly approached the Mexican boxer and told him that he disagrees to his comment that the Filipino boxing icon has a chance of defeating Floyd. After Wednesday's red carpet kick-off press conference for the Pacquiao vs Mayweather mega-fight in LA, Morales in an ambush interview with Radio Rahim said he thinks Manny will win because he is faster and has stronger legs than Floyd. He also believes that the undefeated American boxer "doesn't have the heart" to beat Manny. You can watch the 47-second clip of the interview here. 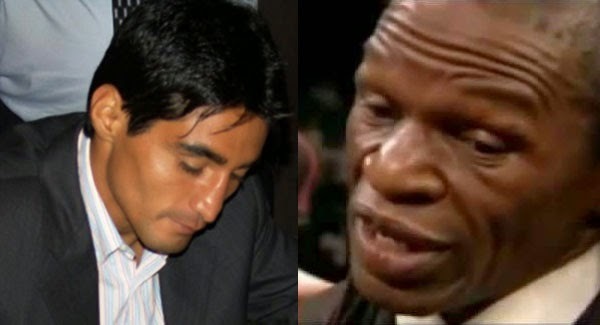 Morales apologized for making such remarks, but Mayweather Sr. said he need not be sorry. The trainer, whom netizens said looked drunk, performed an impromptu rap about his son in front of Morales and other members of the media. However, many said they were wondering if the Mexican boxer-turned commentator understood a word.